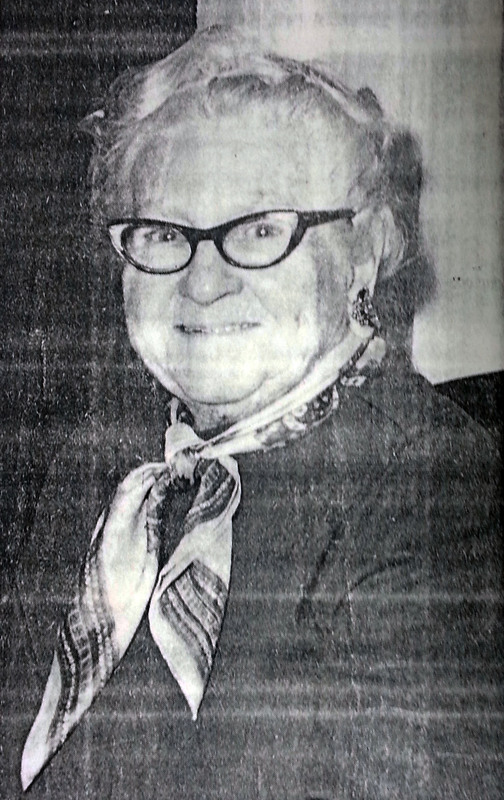 A SOUTHERN BELLE – The charming and intelligent Annie Goodman remembers the old South well, but continues to remain highly active in Landis Town life in the 1980’s, The Daily Independent (Kannapolis, NC), 20 Apr 1980. Photo by Terry Andrew-Lavage. Source: www.findagrave.com, # 90645366; Ancestry.com. The Concord Daily Tribune (Concord, NC), 18 Apr 1907, p.4. Register of Deeds C. A. Isenhour on yesterday issued marriage license to Mr. P. A. Goodman and Miss Annie Ritchie. The Tribune is informed that the young couple were married last night. The groom is from Mt. Pleasant, and the bride is the daughter of Mr. Luther Ritchie, of Number 6 township. The Daily Independent Magazine (Kannapolis, NC), 20 Apr 1980, p. 1-E. Independent Staff WriterLANDIS – Charming, witty, gracious. All of those adjectives could be used to describe the delightful Mrs. (Annie) Prince Goodman of Landis.At 92, she doesn’t look a day over sixty. When asked the secret of her youthfulness and vitality, Annie Goodman quipped with a smile and a twinkle in her eye, “Because I’m so mean.” But nothing could be farther from the truth. On May 2 Annie will take to the stage for the Choral Ensemble representing her alma mater, Mont Amonia [sic] of Mount Pleasant, one of the state’s first three colleges. For her performance, Annie Goodman will don the traditional apparel she wore to class every day and give a short recitation on her years as a Mont Amonia [sic] student. Mont Amonia [sic] was a boarding school in Mount Pleasant. Instead of staying at the school Annie lived in town with two spinsters, Miss Sarah Barringer and Miss Lahr. “They were so nice to me,” she remarked. “I can remember sneaking out in the evening and going back to the school. I had some friends who lived on the ground floor. I’d tap on the window. It would go up and I’d hop in. If one of the instructors came around, they hid me.” she said as she began to smile at the memories of days gone by. Returning to a discussion of the costume she would wear during the play, Annie explained that the Balkin blouse’s construction enabled the owner to hide a peek sheet without detection. “I once made one for the beatitudes. Though I knew them, I never could remember which order they came in. However, during the exam the teacher stood behind my friend and me and we never got to use them,” she laughed. Students at Mont Amonia[sic] took music, voice, Latin, mathematics and art in addition to other subjects. The school yard was fenced in and each afternoon, with a teacher to lead the line and one at the rear, the girls were walked. “they would march us up by the college, (North Carolina College for men) but you didn’t dare look up there. Those were the good old days.” she said. The one perception which stands out in her mind as the main difference between the youth of today and her adolescence was parental authority. “If poppa said no, it was no,” she said. Though she lived in town part of the time, Annie Goodman spent a lot of her younger days on a farm. Her father, who seemed to be a jack of all trades, farmed, taught school, owned a meat market and owned a livery stable. Born in 1888, Annie Goodman was 10-years-old when the murder of Emma Hartsell took place. She remembered the fear that swept through the town. Eventually someone wrote a ballad about the fatal episode. “I used to sing it a lot when I was younger and then I’d get scared and have trouble going to sleep,” Annie Goodman commented, but the incident made enough of an impression on her to remember the song years later. When first married, Prince and she would frequently take a Sunday drive in the surrey as they rode by St. John’s Lutheran Church, the couple would shout to the preacher and his wife to come up to the house later because they were going to make ice cream. After she was married a while, Annie Goodman decided she wanted to try something new ans so she went into the business of selling corselettes for the Charis Corporation. She has pins denoting her achievements as high saleswoman of the year from the company. One of seven children and the mother of four, it doesn’t seem likely that the amazing Annie Goodman would ever meet a stranger.